When Meghan Quinn Author told me she was writing a story she thought I’d enjoy, a military romance, I was over-the-top excited! I knew from the beginning that this story would be different—less humor, some heat, and more heart. Full of so much SWOON and SOUL, The Upside of Falling made me fall hard in love from the very first page and never stopped. The Upside of Falling HITS DEEP. I was ENAMORED with this full of depth and breadth love story! The Upside of Falling has ALL THE HEART in a story that strikes straight to the soul. Colby and Rory!!! Whoa!!! I was seriously hooked on these characters who melted me so much! The broody and broken hero and fierce and full-of-life heroine stole my heart. Their connection was fierce from first sight like a magnet drawing them together. The Upside of Falling’s plot of many layers pulled me in like a pilot to his plane. Polarizing. Paralyzing. Passionate. Perfection. All the angst-burning PERFECTION!!! 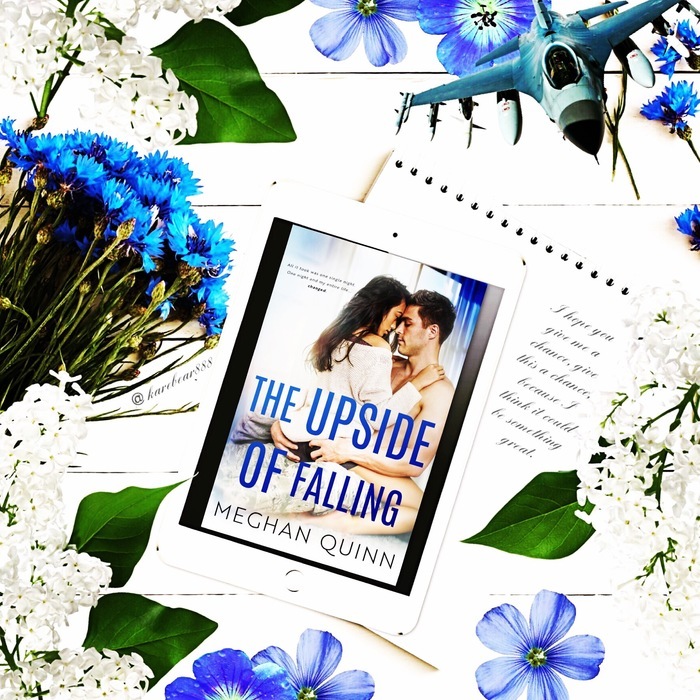 The Upside of Falling is a military romance but so much MORE: The Upside of Falling is a love story of two black and white lives suddenly splashed with color. The Upside of Falling is a hard-fought journey of strength and sacrifice, one of overcoming adversity, and learning to love and trust. The Upside of Falling is a paralyzing and passionate story of rising after falling, of taking that leap of love. The The Upside of Falling is EVERYTHING!!! My heart has been caught—captured by The Upside of Falling—as it glides through the air like a fighter jet, straight to Cloud Nine. An old school military romance, The Upside of Falling reminds me a bit of my own soldier love story, one that hit every part of my heart. This is one of the sweetest and most soulful slow burns you’ll ever read. I was BREATHLESS! The Upside of Falling is so BEAUTIFULLY WRITTEN, such a stunning and soulful story. SWEET SIGH. Meghan Quinn was right: I LOVED The Upside of Falling! LOVE, LOVE, LOVE!!! Meghan ‘Master Storyteller’ Quinn has poured her heart into this story, and I can feel that passion and love through the words. In one HEART-SOARING STORY FULL OF FEELS, Meghan Quinn has aced the military romance trope. The military wife in me salutes this love story. I WAS BLOWN AWAY by a book that broke me in the best way! Act in spite of your fear. The Upside of Falling is, hands-down, a TOP 2018 ROMANCE! I’m just a girl crying tears of love into her kindle from Meghan Quinn Author’s heart-hitting hockey romance, One Baby Daddy, a roller coaster of ROMANCE BLISS. SWEET SIGH! One Baby Daddy MELTED ME. This book made me BREATHLESS as it CRASHED INTO MY HEART. One Baby Daddy is an IRRESISTIBLE tale of heart meets heat—a written treasure—and I could not help but FALL HARD for this love story. Hayden Holmes, where do I begin?!? This hot hockey hero with a huge heart stole my heart. Mr. Romance felt real! I’ve always been #TeamJock and Meghan Quinn wrote Hayden to perfection. Hayden is HERO PERFECTION! I loved Adalyn as much as Hayden. She’s beautiful, super smart and full of snark. This heroine pulls no punches and I found myself nearly applauding her a few times for her bold and brash words, some delivered as zingers that I had to admire. This hero and heroine were magical together! Meghan Quinn wrote the ULTIMATE LOVE STORY. One Baby Daddy checks off all the romance boxes: hot and huge-hearted alpha of a hero paired with a strong heroine, delicious sexual tension, wonderfully witty and full of butterfly-fluttering feels. It may just be my favorite book of this author’s to date. This slow burn of a romance made me SMOLDER and SWOON so much! One Baby Daddy is so PUCKING GOOD! Game on. Adalyn will be mine. Coming off an abrupt end to his season, Hayden Holmes wants nothing more than to forget about the dramatic season-ending game and get lost. So he returns to his hometown, Binghamton, New York for some relaxation, never expecting to meet a fiery yet funny nurse who takes his breath away. They fall fast and hard for each other but with one life-alternating phone call, a massive bump in the road is firmly planted in front of them—and I’m not talking about a baby bump. Hayden if left trying to fight for his relationship with Adalyn, but during the process, he never knew he was going to get Adalyn pregnant, and he sure as hell didn’t expect to have to fight for her affection either.